This oddly fantastic concoction was born out of inspiration from this recipe on How Sweet It Is. I follow a variety of blogs for a number of reasons, & I read this particular blog for it’s beautifully photographed food, not necessarily the food itself. But a few days a go a recipe caught my eye & got my creative juices flowing. 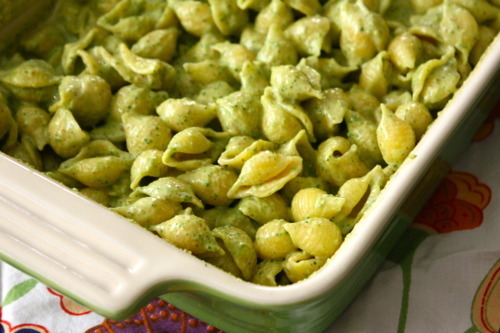 I love pesto, I love mac & cheese (who doesn’t? ), combining the two for a super super jazzed up version of comforting bliss? I’ll take it. 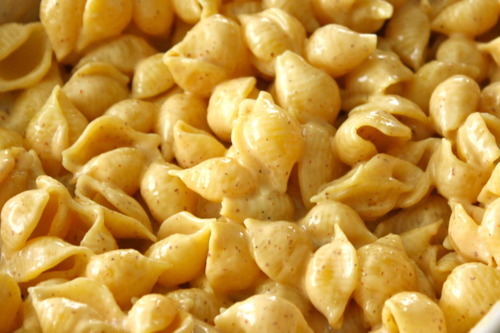 I’ve been craving mac & cheese, like, forever. I recently stumbled upon the frozen Candle Cafe Mac & Cheese on sale at Whole Foods, so I grabbed it, rushed home, waited rather impatiently as it heated up & was sadly & thoroughly disappointed. Ever since then I’ve had a hankering & wanted to do it homemade. I’ve only made one attempt at a homegrown version on vegan mac. It was ok. I needed better than mediocre, I needed mind blowing. I’ve collected nearly a dozen recipes from around the blog-o-sphere for vegan mac & cheese, & the one recipe that called to me the most was the non vegan recipe. Go figure. As my weeknights are busy, I don’t get to play as much in the kitchen, so I love to have one or two weekend cooking projects lined up so I can bust out my inner domestic goddess. This was my perfect, under the weather, stuck in the house challenge: get to work on how to make a vegan version. 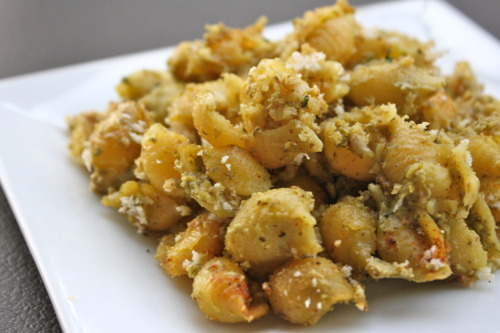 In a food processor, combine garlic, arugula, almonds, vegan parm & lemon juice. Pulse until combined. 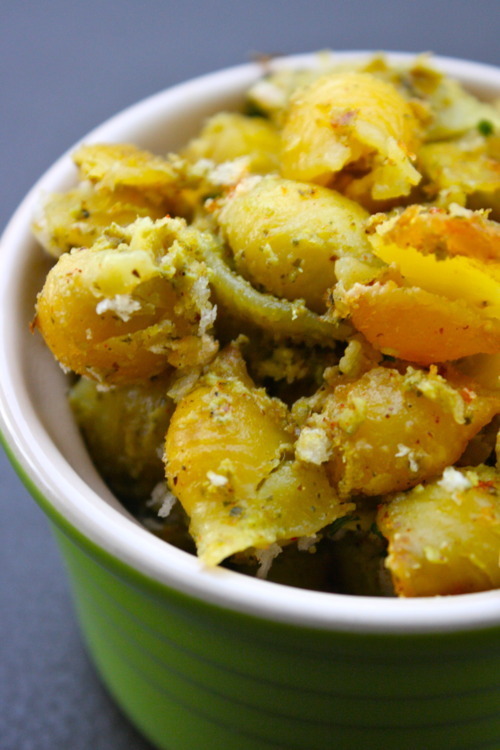 Stream in olive oil a tablespoon at a time until the pesto becomes smooth. Taste & add sea salt if needed. The biggest challenge was deciding on a “cheese” sauce that would mimic the mild white cheddar part of the recipe. After looking at countless sauces from the most simple to the most complex, I finally settled on the Quick & Easy Vegan Alfredo from Angela at Oh She Glows. This sauce was everything I needed it to be – creamy, mild, yet flavorful. I was a bit worried as Angela said it dried out upon reheating, & my dish called for baking, but as this was an experiment, I kept an open mind. 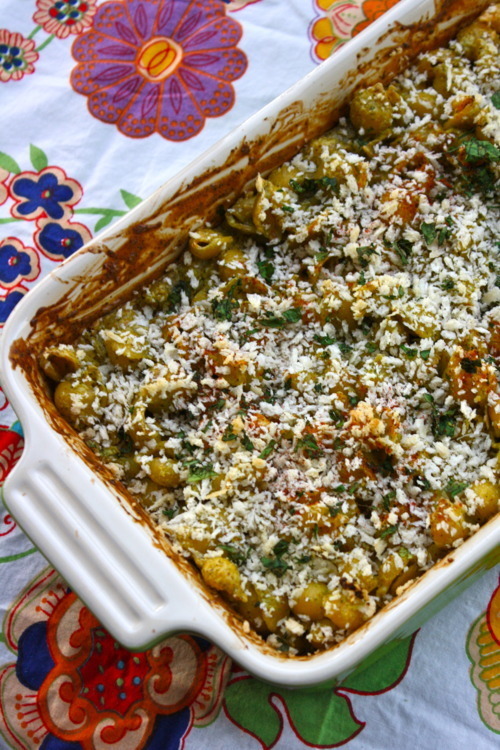 While I am not trying to be gluten-free, I liked the idea of using something healthier than semolina. 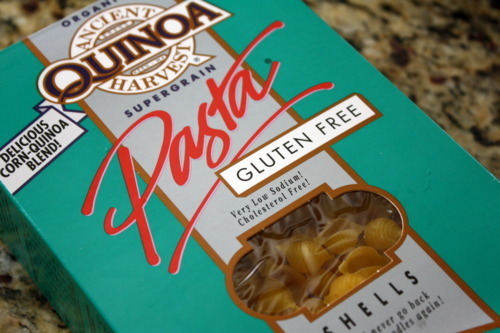 I’ve used this brand before & really like it as an alternative to whole wheat, which I usually buy. I’ve learned that I prefer this pasta cooked a bit longer than recommended. The package instructions advise not to over-cook, but I’ve found that even after 10 minutes it’s too chewy, so I let it go until 12. Even though I was baking this dish, I decided not to under-cook it. 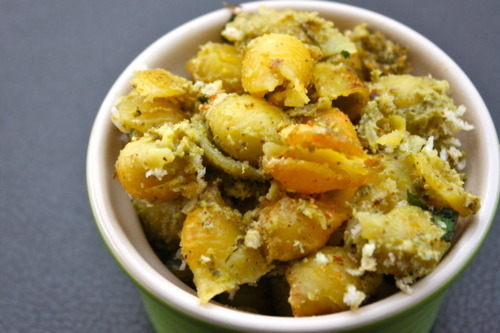 Hello crispy, bubbly, aromatic, & absolutely gorgeous vegan mac & cheese! Bring water to a boil & cook pasta according to directions. 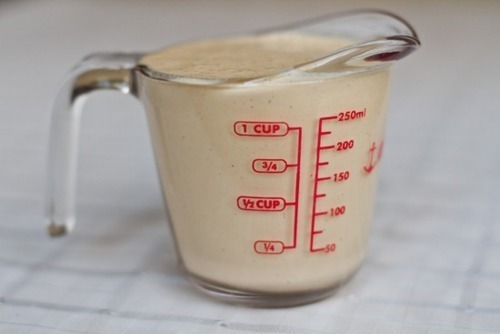 While pasta is cooking, make the vegan alfredo sauce. Add pasta to a baking dish & pour alfredo sauce over top. 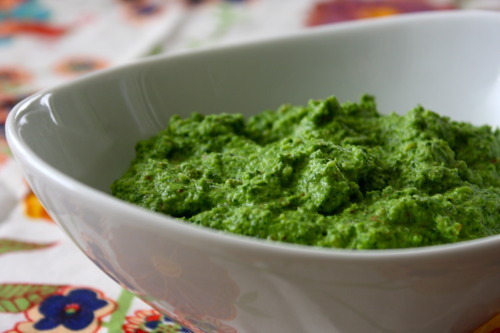 Stir to distribute sauce, then stir in pesto. 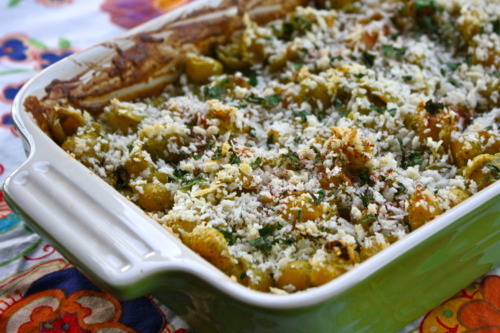 Top with bread crumbs, parsley & paprika. Bake for 30-minutes, until top is golden & bubbly. Cheers to sweet, or savory in this case, success! Please make & enjoy!